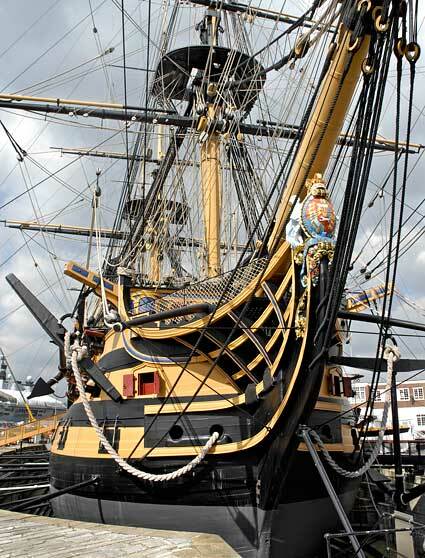 HMS Victory was launched in 1765 at Chatham Dockyard and commissioned into the Royal Navy in 1778. She continued in active service for the next 34 years which included the famous Battle of Trafalgar in 1805. 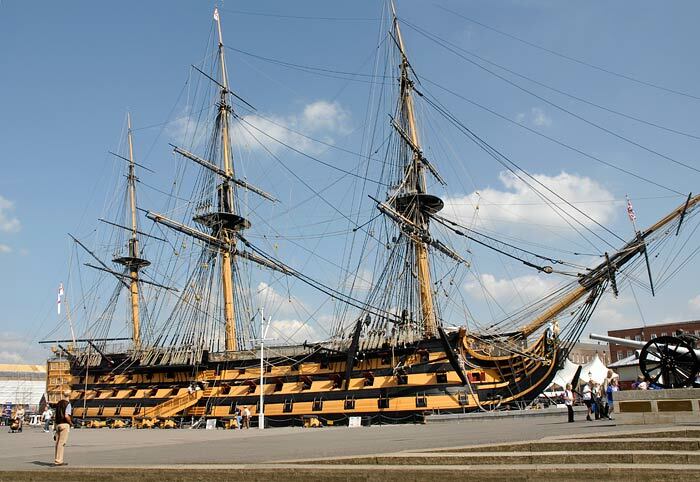 In 1812 the Victory was retired from frontline duty and anchored in Portsmouth Harbour. 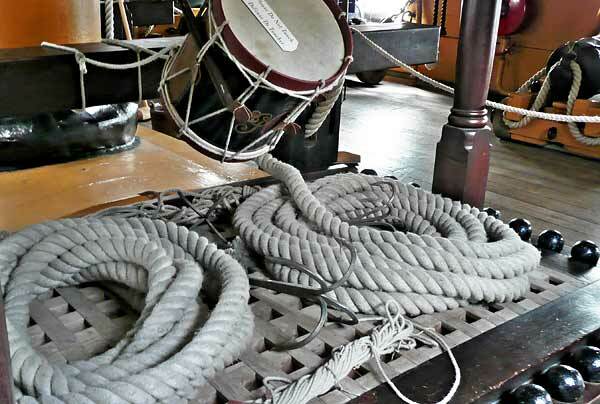 For the next 110 years the Victory remained at her moorings in Portsmouth Harbour fulfilling a combination of practical and ceremonial roles. 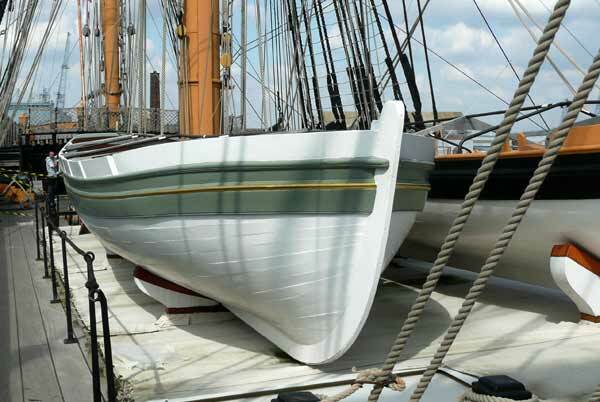 In 1922 amid fears for her survival, Victory was moved into Portsmouth's Royal Naval Dockyard and work began on restoring the Victory to her 'fighting' 1805 condition, the work still continues to this day. 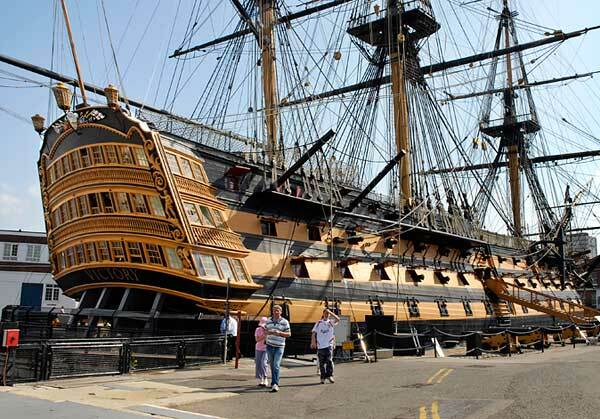 HMS Victory is the world's oldest commissioned warship still in use and the flagship of the Second Sea Lord, Commander in Chief Naval Home Command. As such she demonstrates the skill of the dockyard shipwrights and ship designers from the mid 18th century. 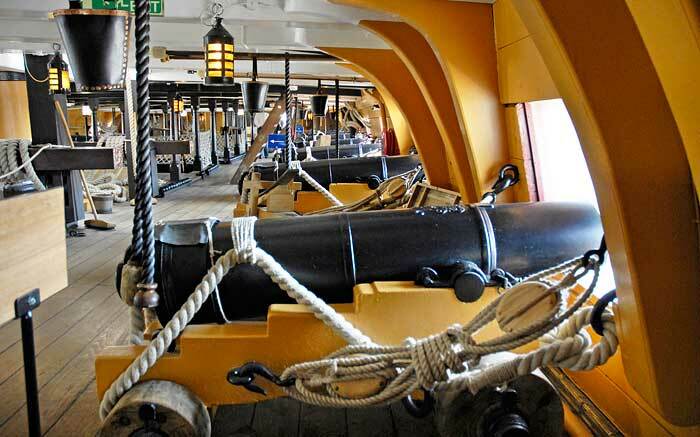 The stern galleries, at the top is Captain Hardy's, in the middle is Admiral Nelson's and the officer's wardroom at the bottom. In battle the partitions and furniture were removed to be replaced by guns. 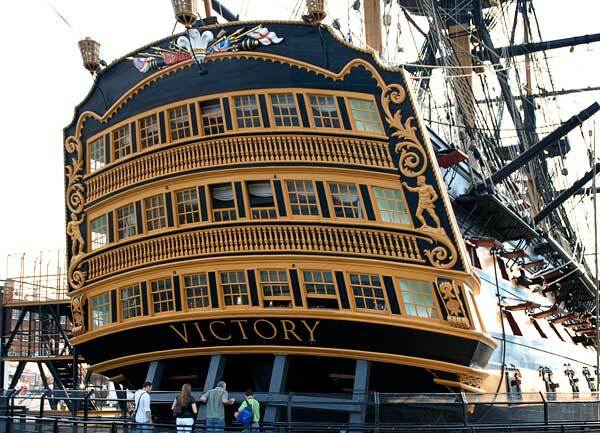 A few facts and figures about HMS Victory; Length: 227ft, Beam: 52ft, Displacement: 3,600tonnes, Max speed: 8 knots, Timber used (mainly oak) 100 acres, Crew at Trafalgar: 821men, Length of the ship rigging 27 miles. 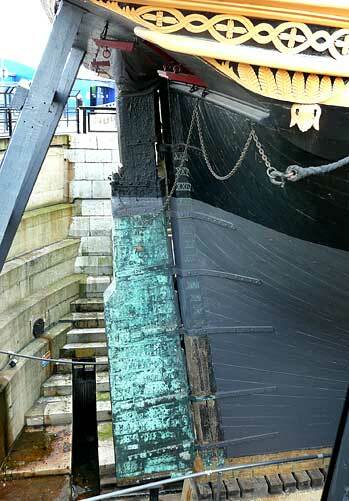 HMS Victory has four masts, the bowsprit, the fore mast, the main mast and the mizzen mast. 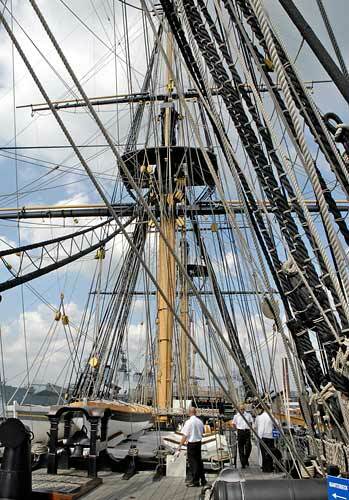 The tip of the main mast is some 220ft above sea level and the four masts can fly some 4 acres of canvas. The Admiral's Cabin and beyond that the Day Cabin. Captain's Day Cabin. 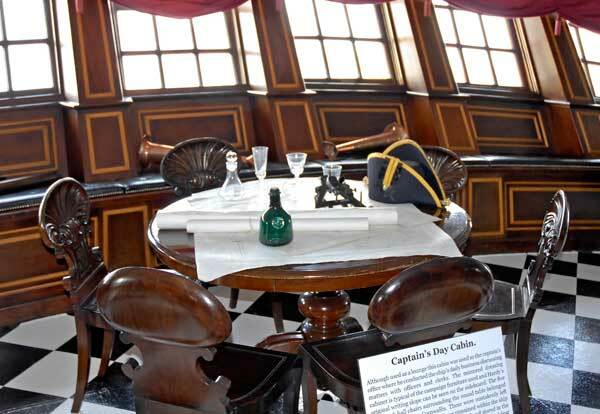 The shell back hall chairs surrounding the table belonged to Admiral William Cornwallis. They were mistakenly left on Victory in 1803 and have remained on the ship ever since. One of Victory's three gun decks, in all the ship had a total of 104 guns. The upper gun deck had 12 pdr guns, the middle gun deck 24 pdr guns and on the lower gun deck the large 32 pdr guns. 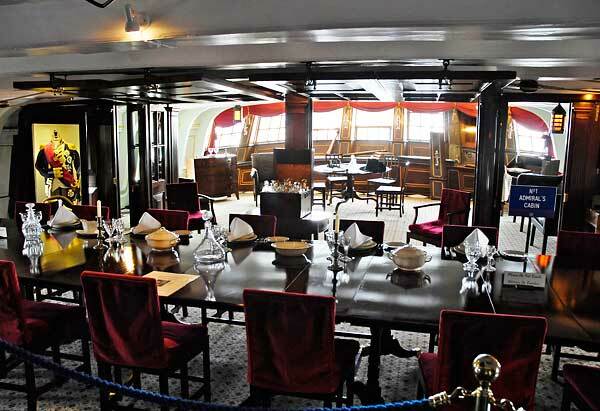 The Lower Gun Deck was the main living area for the seamen, at meal times some 560 men sat down at 90 tables to eat their meals, at night it was home to 480 sailors. The Admirals Barge, which carries the admiral to and from the ship. 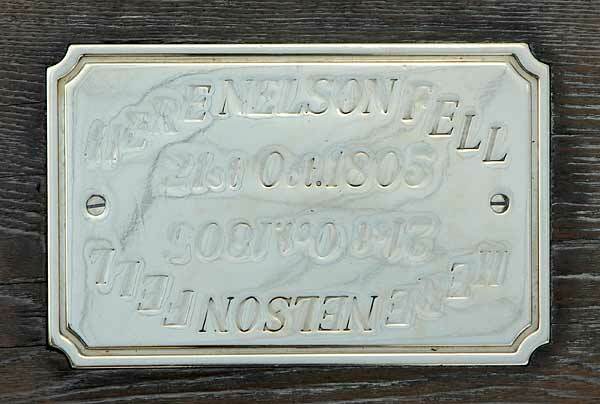 The plaque on the Quarter Deck marks where Admiral Lord Nelson fell mortally wounded during the Battle of Trafalgar. 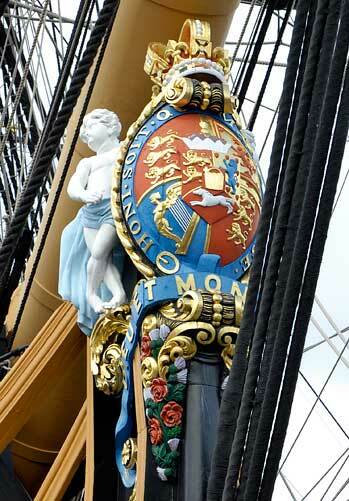 HMS Victory's figurehead is a replica of that fitted during the ship's large repair between 1801 and 1803. The original 1765 figurehead can be seen in the Royal Naval Museum. Right, Victory's rudder.